Aloe vera is a desert plant that belongs to the lily family. It grows well in dry soils and is native to East and South Africa. The fleshy leaves are sharp and serrated with white spikes; they contain a clear gel harvested for its healing properties. Aloe is thought to be one of the oldest remedies, noted for its healing qualities in Egyptian, Roman, Chinese, Greek, Italian, Algerian, Moroccan, Arabian, Indian and Christian history. Cleopatra is known to have massaged it into her skin and it appears in Anglo Saxon medical texts, having been brought to Europe in the 10th century. In modern times, the healing qualities of aloe were found to be more effective than any other method in the treatment of radiation burns. Aloe soothes itching and reduces redness; it is excellent in calming sunburn or redness caused by the cold. It softens the skin and helps to protect it. In bath products, aloe soothes the skin as the warm water bathes the body, making our Honey Bee ballistic a gentle calmative for troubled skin. We use the dried ground aloe leaf to make the extract. The dried aloe leaf is warmed with water and put straight into a whole range of skin-softening products from moisturisers to soaps. We use aloe extract in Honey I Washed The Kids soap to calm and soothe the skin. It also adds a darker colour to the soap. We use this re-hydrating aloe extract and the aloe gel in both our Skin Drink and Ultralight moisturisers to enhance the texture of the skin and to level out uneven skin tones. 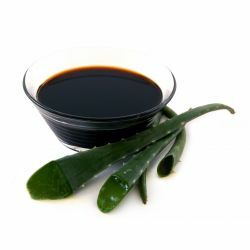 The aloe extract is also responsible for the light brown colour of the creams.